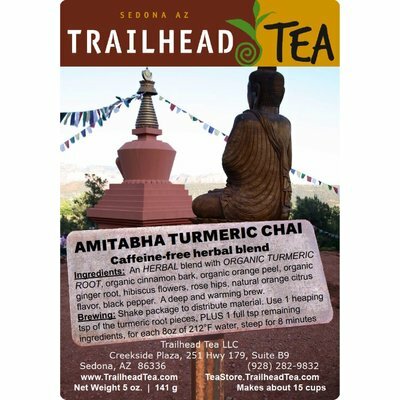 Caffeine-free HERBAL BLEND of organic turmeric root, organic cinnamon, organic orange peel, organic ginger root, hibiscus flowers, rose hips, natural orange citrus flavor, and a bit of black pepper. 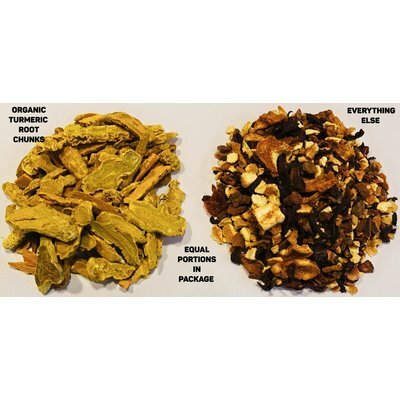 This is Eileen's unique and personal turmeric HERBAL TEA BLEND, experimented over many months. 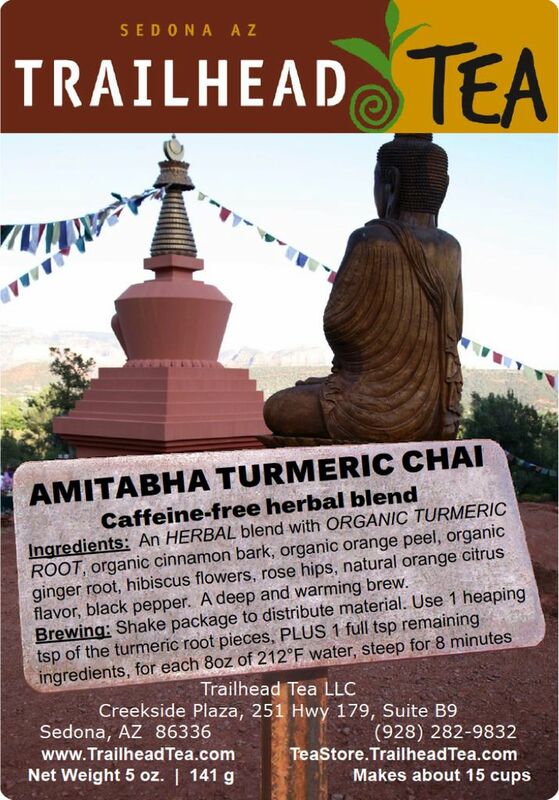 Turmeric can be very strong and difficult to enjoy for some, and this blend has received great reviews. This caffeine-free TURMERIC-CINNAMON-FRUIT BLEND also contains organic orange peel, organic ginger root, hibiscus flowers, rose hips, natural orange citrus flavor, and a bit of black pepper. It's a deep and warming brew. According to WebMD: Turmeric is an anti-inflammatory used for arthritis, heartburn, joint pain, stomach pain, Crohn's disease and ulcerative colitis, bypass surgery, hemorrhage, diarrhea, intestinal gas, stomach bloating, loss of appetite, jaundice, liver problems, stomach ulcers, irritable bowel syndrome, gallbladder disorders, high cholesterol, a skin condition called lichen planus, skin inflammation from radiation treatment, and fatigue. Package or tin size is 5 ounces of full leaf tea, which yields a conservative 25 first cups. Because we use the large turmeric rhizome/root pieces, the weight of ingredients to cup is high, but you also get a second fully satisfying cup on the longer next infusion, which is not common for herbals. Bulk one pound is available for about 80 cups. BREWING: One teaspoon of turmeric root, and a second teaspoon of everything not turmeric, for every 8 oz of boiling 212°F fresh water. Steep for 8 minutes on the first infusion, and 15 minutes or longer on the second infusion. Built in 2004, located in West Sedona near the base of Chimney Rock and Thunder Mountain. Here’s a link to an excellent description of the stupa and suggestions how to explore for the best experience. This tea is great for inflammation. Been drinking 2 cups a day. Tasty as well. Highly recommend!